Pictures of PDS 70b show a planet that’s still forming. It’s the youngest planet scientists have imaged so far. They figure studying it will help them learn more about how planetary systems develop. I think they’re right. I’m quite sure Professor Ferguson was wrong about Earth being square and stationary. But I’ll give him credit for having a lively imagination. Ferguson’s 1892 “Map of the Square and Stationary Earth” came complete with quotations from the King James Bible. Folks could get a copy for 25 cents. I don’t know how many bought one. An online inflation calculator said that $100 in 1892 was equivalent to $2,663.74 in 2018. That may or may not be exactly right, but I’ll assume it’s close enough for a quick estimate. The 100 to 2,663.74 conversion ratio makes $0.25 1892 dollars equivalent to about $6.66 2018 dollars — which I do not think proves that End Times are Nigh. I talked about numbers, Nero and getting a grip back in 2016. England’s state church gave the King James Bible its stamp of approval — probably between 1600 and 1613. There’s a story behind that, which will wait until some other time. American beliefs and traditions being what they are, I’d better explain why I don’t insist that Helios sets the sun down in the west each night. Or think that our sun literally sinks. Basically, it’s because I’m a Catholic. One who learns what the Catholic Church says by studying resources the Church provides: not by absorbing my native culture’s traditions. I also realize that words like “sunset” and “nightfall” are figures of speech: like “hedge fund,” which don’t necessarily involve a row of shrubbery. Folks who get hurt at nightfall aren’t crushed by Nyx falling on them. I don’t know how many folks seriously believe Earth is flat. They’ve got a point. Select Bible verses, assumptions and 17th-century scholarship helped Ussher pick 4004 BC as the beginning. Folks in Mesopotamia and India started making wheels around that time, and that’s another topic. I figure Job’s imagery shows that descendants of Abraham, Isaac and Jacob lived in a world where Mesopotamian beliefs and stories were well known. It’s a bit like today’s Western way of life: an influence that’s just about everywhere. The comparison isn’t exact. Ishtar and Gilgamesh, for example, aren’t just like Marilyn Monroe’s Lorelei Lee and Harrison Ford’s Indiana Jones. Or today’s Homer Simpson. The Simpsons and Indiana Jones?? The point I was stumbling toward is that many folks who aren’t Western are familiar with my culture’s ‘big names.’ Major Mesopotamian powers had a similar influence in their day. “For the elements, in ever-changing harmony, like strings of the harp, produce new melody, while the flow of music steadily persists. And this can be perceived exactly from a review of what took place. Others folks apparently assume that since the Bible isn’t ‘scientific,’ it can’t be true. In principle, I could decide that Babylonian astrologers had all the answers or that science gives me everything I need. Those aren’t my only options. I could believe only what my senses show me. Or that physical phenomena are illusions. Or that ‘spiritual’ is good and ‘material’ is bad. Or some other worldview. God could, I’m sure, have given us all the ‘science’ we’ll ever need. But that’s not how it is. There’s more to God than what we’ll find in nature, which brings me back to the Bible. I don’t “believe in” extraterrestrial life. I don’t disbelieve either. I think there’s life elsewhere in this universe, or there isn’t. If life is out there, I think we’ll find it. Eventually. Even if Star Trek’s “new life and new civilizations” aren’t there, I’m quite sure some of us will keep looking. We’ve already found many “strange new worlds” since 1992, when scientists announced confirmation that a pulsar had planets. The planets themselves aren’t particularly odd. What’s strange is that they exist at all. 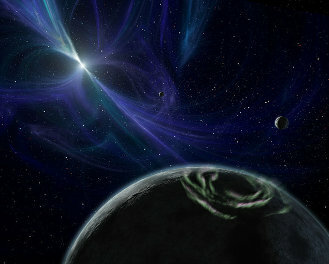 Scientists hadn’t expected to find planets orbiting a pulsar. The pulsar and its planets have had official names since 2014. Phobetor is a super-Earth, a rocky planet more massive than our home. Poltergeist is probably rocky, too. Draugr is less massive than any planet in the Solar System. Apart from their mass, super-Earths probably aren’t much different from the Solar System’s inner worlds. The Extrasolar Planets Encyclopedia’s catalog listed 3,797 confirmed planets in 2,841 systems on July 1, 2018. The total may have gone up since then. Or if there’s a ‘first-something’ to report. Like an image released this month, showing a planet we call PDS 70b. PDS 70b isn’t the first exoplanet imaged by astronomers. That was Beta Pictoris b. Or 2M1207b. Or some other one. Which you pick depends on what’s meant by “first” and “imaged.” Among other things. Beta Pictoris b is on an image made in 2003, but not particularly noticeable: a tiny speck. Scientists didn’t identify it as a planet until the image’s data was reprocessed in 2008. PDS 70b probably isn’t all that odd. It’s almost certainly going to be a gas giant, several times Jupiter’s mass. It’s the youngest planet that astronomers have imaged. “Astronomers have captured this image of a planet that’s still forming in the disk of gas and dust around its star. “Researchers have long been on the hunt for a baby planet, and this is the first confirmed discovery of its kind. “Young dwarf star PDS 70 is less than 10 million years old, and its planetary companion is thought to be between five and six million years old. Astronomers knew about PDS 70 and the gap in its protoplanetary disk at least as far back as 2004. What we’re learning about planet formation said there should be a big planet in the gap. One that’s still taking shape. Finding PDS 70b took folks at ESO’s Very Large Telescope, the VLT, a few more years. So did confirming that it’s a planet. What they learned told them a little more about PDS 70b. PDS 70b’s approximate temperature and size are just that: approximate. Its ‘light’ at different wavelengths is a pretty close match to better-known gas giants. Those are between six and 14 times Jupiter’s mass. PDS 70b’s diameter is almost certainly upwards of 1.3 times Jupiter’s. Its temperature, based on wavelengths scientists used, is probably 1,200 K. Give or take 200. PDS 70 is about 370 light-years out, in Eta Centauri’s general vicinity. Some stars, like Antares and Sirius, have proper names and Bayer designations. Antares and Sirius would be Alpha Scorpii and Alpha Canis Majoris in Bayer’s atlas. Eta Centauri was called Kù lóu èr by Chinese astronomers, and that’s yet another topic. Eta Centauri is part of the Scorpius-Centaurus Association, stars moving at pretty much the same speed in the same direction, spread across about 700 light-years. Some, like Antares, are visible from Earth. Many aren’t. One of them, HD 113766, is more or less between Eta and Epsilon Centauri. It’s another young star. Two stars, actually. HD 113766 A, the binary’s brighter star, has what looks like a planetary system forming around it. An Earth-like planet may be in 113766 A’s habitable zone in a few million years. I don’t think we’ll be sending a probe to PDS 70 or Eta Centauri any time soon. If we did, it’d go past Theta Centauri on the way out. That star is just shy of 60 light years away. It’s an evolved giant star. The star Earth orbits is a main-sequence star. That’syet again another topic. Theta Centauri has another proper name, Menkent. Calling it an “evolved giant star” isn’t improper. Not in the ‘banned in Boston’ sense. “Proper name” in this context is what English teachers call a proper noun: a particular person, place or thing’s name. A common noun is the technical name for what we call something that’s one of a class of things, like a pencil or a bit of dust. Common nouns aren’t capitalized. They’d blow their noses in public and don’t know which fork to use. Saying that stars have noses is farce, sort of. And that’s still another topic. Menkent is what some folks call the “traditional name” for Theta Centauri. I’m not sure where or when the tradition started, or who started it. I’ve read that it’s an Arabic word for shoulder plus “kent.” If so, “kent” probably started as Latin “kentaurus,” or centaur. PDS 70 doesn’t have a cool name like Menkent or Sirius. Not yet. The “PDS 70” designation is starting to work on my nerves, so I’ll make up a proper name. That’s why I started looking for stars with names. Menkent’s name in China was Kù Lóu sān, third star in Kù Lóu. It’s not as memorable, to my Western ears, as Menkent. I’m not sure what Kù Lóu means. Probably “arsenal” or “library.” Or something else. Let me think. PDS stands for Phoenix Deep Survey, which is a proper noun. But it’s a catalog’s name, not an individual star’s. And I want something short. Shorter than “Phoenix Deep Survey,” anyway. “Veetoo” reminds me of “Star Wars.” “Peedee” reminds me of Dee Dee in Genndy Tartakovsky’s Dexter’s Laboratory series. This decision isn’t as easy as I thought it would be. But it’s trivial, so I’ll pick Peedee and move along. I might have been more tolerant of PDS70 b’s designation if I hadn’t been wading through terms like NIR, VLT/NaCo, PDI and ADI. All of which relate to SPHERE on the VLT. I don’t mind technobabble. Usually. Like any other specialized jargon, it helps folks share information without unnecessarily long words and phrases. Imagine that you’re at the European Southern Observatory, ESO, putting a ‘where you can find me’ note on the break room message board. You’ll be using the Nasmyth Adaptive Optics System and Couder Near Infrared Camera. You can write “I’ll be at the NaCo.” Or you could try fitting the whole name on one note. Maybe you could, and still be legible. My preference would be using the acronym. I’ll probably more about the ESO’s tech and alphabet soup in another post. Today I’ll keep it short. Shortish. The ESO’s Very Large Telescope, VLT, is part of Paranal Observatory. The VLT includes four optical telescopes. Each has a primary mirror 8.2 meters across. That’s more than half again as large as Palomar’s famous 200 inch reflector. Astronomers mostly use each telescope separately. Some observations take all four telescopes working together as an astronomical interferometer. That’s how researchers got images like the ones of PeeDee and its still-forming planetary system. Confirming that Peedee has a planet in its protoplanetary disk is a big step forward. So is getting images of the still-forming planetary system in several infrared wavelengths. Scientists now know more about that planet than many others. Studying the Peedee system — I like that name, but don’t expect the IAU will make it official. We’ll learn more about how planets form by studying the Peedee system. We know more today than we did in my youth. Or a few years ago. But we’re not running out of questions. Scientists seem to be finding new puzzles faster than they’re solving old ones. We still don’t know that the Solar System formed when a nebula, a cloud of gas and dust, collapsed. Or if that’s the way most planetary systems take shape. Not the way I know that Abraham Lincoln made the Gettysburg Address. That sort of well-documented certainty would take observations made and recorded over the last several billion years. Our astronomical records cover interval a millionth that size. “Three Stars Each,” the first Babylonian star catalog we’ve found, is about three and a half millennia old. Maybe some galactic philosopher’s guild left a probe in what became the Solar System, and has been keeping a file on our planetary system. I wouldn’t count on it. Our knowledge of what’s been happening in this universe comes from studying what we’ve seen since we started paying attention. Until about four centuries back, what we knew about stars and planets was limited to what our eyes could tell us. Then Galileo and others repurposed the “Dutch perspective glass” for astronomical work. Many of them realized that Aristotle and Ptolemy’s conclusions didn’t match what they were seeing. Copernicus thought Earth went around our sun. He wasn’t the first with that idea, not by several millennia. But he had data and math to back up his heliocentric model. Time passed. Natural philosophy became science. Swedenborg published an early nebular hypothesis. Swedenborg’s idea about planetary system formation made sense, to a point. His theology didn’t. One the other hand, I think his take on End Times was imaginative. But Swedenborg’s nebular hypothesis seemed like a reasonable explanation for how planetary systems form. So were several other ideas. My high school science textbooks discussed several scientific ideas about how stars and planets form. One of them was an updated version of Swedenborg’s nebular hypothesis. Scientists using new data and math were solving some ‘nebular’ puzzles. Finding nebulae at different stages in the planetary system formation process helped. My guess is that we’re pretty close to what will be a theory, not a hypothesis, of planetary formation. Getting closer, at any rate. I could start denouncing the nebular hypothesis and science, spouting “Scripture that condemns” it. I won’t. Thinking that this universe is ancient, vast and impressive is not a new idea. “All your works give you thanks, LORD and your faithful bless you. Living in a universe that’s unlike Babylonian cosmology’s doesn’t bother me. Neither does thinking that it’s far older than a 17th century Calvinist’s chronology said. Even if I felt distaste for God’s creation, it wouldn’t matter. This entry was posted in discursive detours, science news and tagged astronomy, Bible, exobiology, exoplanets, faith, planets, science, technology. Bookmark the permalink. Sorry, just switched off there. To continue. I have great difficulty balancing in my mind what the Bible, (or the Church), teaches and what science has discovered and taught. I doubt that any omnipotent all-knowing Creator would have created a square of a flat Earth, (or planet), because as we all know, this is not an aero-dynamic shape and such an Earth would not last long before knocking into other heavenly bodies and knocking its corners off! I think a clever God would have created a circular/global Earth and other planets too. This is me, a non-scientist, talking. As for the Bible, I cannot understand why an omnipotent God who creates the whole Universe and all that is in it in less than a week, (did He take that long), would need a rib from Adam to create Eve? Are women really that complicated? As for Star Trek, like my father used to say, “Always take everything with a pinch of salt!” Mind you, he always made a bad cup of tea. I have my doubts about Star Trek and Captain Picard when he says “To boldly go …” My English teacher always told me never to split the infinitive. She also once told me “your grammar stinks!” I was very upset since my grandma always smelled of lavender perfume and eau-de-Cologne! God bless you, Brian. Your articles always set me thinking. I’m glad to hear that. I think rather highly of thinking. About attention span, spanners and all that, at least one other post spun off from this one. It’s still out there, whirling somewhere between Tuesday and the week after next. Somewhen. I’ve got a folder packed with that sort of thing. God, the Bible, Western literalists and science keep my culture from getting bored: if nothing else. I think Pope Leo XIII was right. God makes this universe and the Bible. The Almighty isn’t a liar. Sometimes we don’t understand how what we see in physical reality and what we think we see in the Bible fit together. That doesn’t mean the universe is real and God isn’t, or the other way around. Or that God is fooling us. We don’t understand because God’s God and we’re not. But we’ve got brains. If we keep paying attention and thinking, we’ll eventually see the connections. Not with God-level understanding, but well enough to know that there are connections. That’s a massive paraphrase, of course. We’ve been on a very steep learning curve for the last several centuries, and are still catching up. I don’t have a problem believing that poetry isn’t science and is still “true.” But my quirky wiring makes seeing connections easy. Trying to explain what I see takes more work. Sometimes I’m not sure what it is, myself. On a related – from my viewpoint – note, I don’t see any reason why the Almighty would not be maintaining more than one physical reality. We might never be able to ‘see’ them, but we’re rather anchored in this one. At this part of space-time anyway. Babylonian cosmology, the ‘plate under a dome’ thing, probably was more poetry and less natural philosophy. It’s not, we learned in Greco-Roman times, how this reality works. But it’s still good for poetic imagery. I’m not sure how the physical laws of a ‘Babylonian’ universe would work. But I figure God could, and has at least one other reality whose physical laws keep it going. And one that works the way Aristotle thought ours did, and another that – – – – I get the idea that God likes to putter. And that’s another topic. Topics.